Germany’s middle-class is shifting rightwards, according to a study by the Friedrich-Ebert Foundation, finding Eurosceptic AfD’s followers in particular supporting right-wing extremist and chauvinist ways of thinking. EURACTIV Germany reports. Right-wing, extremist attitudes have lost considerable ground in Germany compared to previous years. But a study released on Thursday (20 November) by the Friedrich-Ebert Foundation (FES), reveals a troubling new trend. Moderates in German society are increasingly likely to choose more subtle forms of misanthropic and racist thinking; right-wing ideas that are hiding in the mainstream and are suitable for casual dinner conversation. Researchers are concerned about the shift. Isolated right-wing extremist and racist ideas are met with significant support. 36% of those surveyed in the study indicated that Germany should have more courage for national pride. More than 10% said Hitler’s dictatorship also had good aspects. This type of argumentation is especially similar to followers of the euro-critical Alternative for Germany (AfD) party, the study says, a finding that is crucial when the party’s top members deny advocating any form of right-wing ideology. In the ranks of the AfD, right-wing extremist voices have been heard a number of times lately. In October, a party member said the gas chambers in Dachau have been built by the Allied occupation. “The AfD’s followers harbour above-average sympathies for nearly all facets of right-wing extremist ideology”, the study’s author, Andreas Zick, indicated. This includes so-called national-chauvinism, which defines a mentality that Germans are superior to other national groups (41.2%). It also covers downplaying the period under the Nazi regime (14.3%). The polling numbers are higher than the number of Germans who support the neo-Nazi NPD party. The research also indicated a stronger tendency among moderates leaning towards a market-oriented logic of misanthropism – a derivative of social Darwinism and a “survival of the fittest” mindset. The result is systematic abasement of certain non-established minorities, such as asylum-seekers and the unemployed. “Extremely efficient thinking is closely related to right-wing extremist ideas”, the study explained. More than 44% of respondents considered refugees a problem for society. Here as well, AfD-supporters differ considerably from those of other parties. For example, Eurosceptics often feel “that in society – just as in nature – the stronger ones will prevail; that there is valuable and worthless life”. 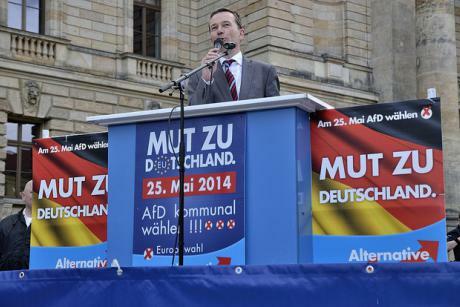 “Through its own political megaphone, the AfD is channelling the connection between fears of being threatened, and market-oriented extremism,” explained Andreas Hövermann, an author of the FES study. Another outcome in the study is that right-wing extremist ideologies go hand-in-hand with a critical attitude toward the EU and degrading citizens from European neighbour states. These attitudes are openly admitted in the study: 24% of those surveyed said they believed Germany would be better off without the EU. As a result, 51% were convinced Germany should assert its strength opposite Brussels. And 38% said Germany should focus on itself more. “The model for a European identity has failed. It is not a model that erases the significance of inequality. The image of European unity with a common identity and support for heterogeneity and diversity does not work,” Zick explained. After EU-wide protests against the Israeli military occupation in Gaza, the authors conducted a follow-up survey. The findings of the later data indicated a particular increase in so-called secondary, “modern” anti-Semitism. Just over half of those surveyed said they were angry that “crimes against Jews were still being held over Germany’s head”. And 50% said they are tired of hearing “about the German crime against the Jews again and again”. Although classical anti-Semitism has decreased compared to 2004, it increased again after the summer of Gaza protests. Over 15% in the survey accused Jews of having too much influence in Germany and 18% said that because of their behaviour, Jews are partially responsible for their persecution. The study’s authors were quite worried about the future, according to their findings. Although 87% of respondents see a clear threat in right-wing extremism, almost 50% are convinced the phenomenon should simply be ignored. But this kind of thinking, “opens the door to right-wing populism”, Zick warned. The study is based on a representative survey of 1,915 people between the ages of 16 and 95. They were surveyed from June to September, 2014. Eurosceptic parties around Europe have shown their willingness to act on a European level. The controversial Dutch far-right leader Geert Wilders recently toured Europe in an attempt to forge a new movement of far-right parties ahead of the European elections. But not many supposed “like-minded” parties were ready to join the initiative, and UKIP, the most vocal Eurosceptic party in the EP, rejected outright the proposition. Eurosceptic political parties are blossoming in many European countries, but their backgrounds and causes are very different. Analysts have argued that even though the next Parliament could have a much higher number of eurosceptic, even populist MEPs, they have a smaller chance of forming a coherent bloc. For more on the EU elections, read our LinksDossier. EURACTIV Greece: ?? ???????? ???????????????? ?????????? ???? ????????? ??? ??? ??????? It seems to me that the Friedrich-Ebert Foundation is surveying the wrong thing. They assume that it is nationalism and national chauvinism which is the danger whereas I would have thought that it is a lack of commitment to the rule of law and to peaceful means of settling disputes. Hitler was not a danger because of his nationalism but because he broke international law when he invaded Poland etc and German law when he permitted the murder of Jews and others. Is there any evidence that the supporters of the AfD condone the breaking of international law or German law? When does limiting immigration, or being euro-skeptic equate to xenophobia or fascism? The AFD would like immigration based on the Canadian system, so that would make the Canadian government fascist. Lately the mainstream German political parties have discussed the same system, which would make them as well xenophobic and fascist. What is the cost of providing for millions more who want to move to Europe and can the economies of these EU countries really afford the price. If the AFD is so politically incorrect why doesn’t the author of this brilliant piece of distorted journalism take in three families of immigrants, house, provide and live with them. Wouldn’t this be an interesting little experiment and short lived as well!. Correct me if I’m wrong but the AFD’s rallies attacked, party members attacked and homes vandalized more than once by young left-wing hooligans? Seems like a little bit of squashing of free speech in a “democratic country”.